As we prepare to say goodbye to the 2018 FIFA World Cup in Russia, we can’t seem to get our mind off of the beautiful game! With the final looming on Sunday, the energy felt by the fans of each team is electric and frankly exciting just to be around. 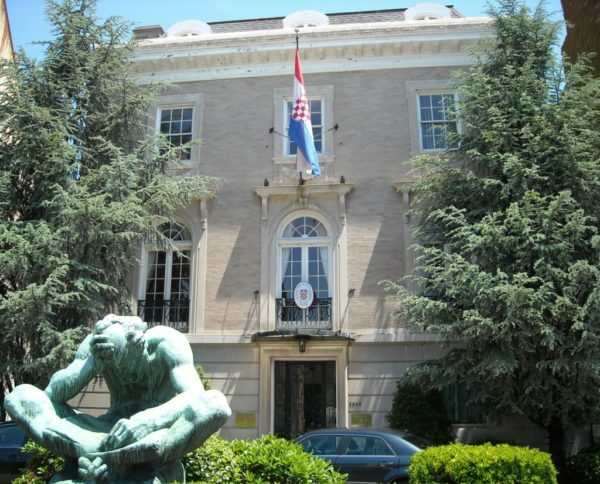 Apart from fútbol, we have a passion for real estate and the architecture of our city, so we thought we’d have our own match-up between the French and the Croatian Embassy through the lens of DC real estate. The current site of the French Embassy is different from other embassies in terms of its location (off Embassy Row), its massive size and fairly recent history. The complex was designed by French Architect, André Remondet and built in the early 80’s by the local George Hyman Construction Company. It consists of four separate buildings that host its chancery, general embassy services, the consulate general and its wonderful space for cultural happenings hosted by the French embassy, La Maison Française. Made up of a ballroom, auditorium and exhibition hall, La Maison Française hosts a variety of events for the general public such as concerts, cinema, dancing and art exhibitions. If they continue in the recent trend as the French team has been advancing in the World Cup, they might even have a World Cup Final Watch Party this coming Sunday! Keep an eye on their Facebook page as they might post the event soon and you need to register to guarantee a free ticket in. The entire 8-acre property boasts three levels of garage parking, over 130,000 square feet of office space (over 160,000 square feet of total building area) and a most-recent tax assessment of more than $65 million dollars! Of the 200 closest properties to the Embassy, the median tax valuation came in at just over $1.2 million. The beautiful 4-story brick building that currently hosts the diplomatic mission of Croatia hasn’t always served the same purpose. In 1928, Austria commissioned a local architect, George Nicholas Ray, to design their new chancery. The total cost for the property and the building at the time was $150,000 and it was completed within the year. In 1993, the Austrians moved on from their current location (not without an eventful timeline of events during their stay) and sold the building to the Republic of Croatia for $2.9 million, which had gained independence less than two years prior. When you pass the Embassy on Massachusetts Avenue today you will see, in addition to the recognizable flag with the red-and-white checkered crest, a large bronze statue of St. Jerome by Croatian sculptor Ivan Mestrovic. The beaux-arts abode has over 13,000 square feet of total building area spread out over its four stories. It also enjoys the company of some expensive neighboring properties with the media tax assessment for the 200 closest properties coming in at $2.4 million! 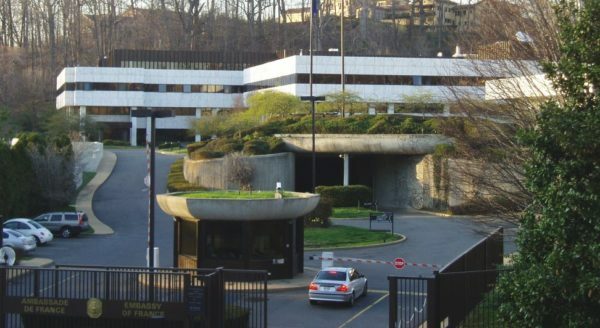 The embassy itself has a total tax value of $4.7 million. While both properties are highly different in terms of their history, their size and even their land values, the two embassies are beautiful landmarks that enrich DC’s architectural tapestry so it’s hard to pick a winner. Much like in the World Cup, games are decided in the details and we give the edge to the Embassy of France due to their tangible efforts in becoming much more environmentally sustainable. Our favorite ones? The wind-generated energy, a 1000 square meter green roof and recycling of drainage water for showers and landscaping. Be it for commercial, residential or official use, Green initiatives are a welcome trend.